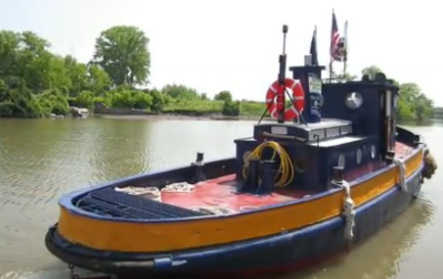 86-year-old tugboat doing canal work in Utica runs on electricity! At 86, you might think it was long past time to retire. Instead, the Tender 4 tugboat has a brand new all-electric engine, combining environmentally-sustainable engineering with retro yellow and blue style of the canal system in 1928. The boat took Utica Mayor Robert Palmieri for a short ride after it was unveiled. The Tender 4 will be put to work removing buoys and doing canal maintenance work along the Utica section of the Erie Canal, New York State Canal Corporation Director Brian Stratton said. The upgrade was made possible through collaboration with New York State Canal Corporation, NYSERDA and the New York State DOT, New West Technologies and Elco Motor Yachts.